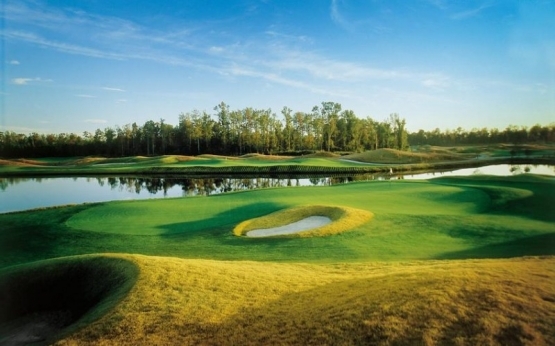 Barefoot Resort has four of the premier golf courses in Myrtle Beach. The Love, Fazio, Norman and Dye courses make up this wonderful 72-hole golf complex. Renowned golf course architect Pete Dye upholds his outstanding reputation of designing some of the most demanding and memorable courses in the world. The white natural sands of the Carolina Bays gave Dye the ideal setting to work his magic in creating a golf experience that will reward good shot making and punish those errant shots that we all hit sometimes. The Dye course offers several sets of tees so that golfers of all skill levels will be able to enjoy this wonderful course. As with all Dye designs the course has a lot of sand, water and waste areas. The fairways feature GN-1 Bermuda grass which is a hybrid developed by Greg Norman Turf. The approaches are TifDwarf Bermudagrass, the greens have recently been redone with Champions UltraDwarf and the roughs have both Zoysia and Centipede grasses. The Dye Club also has a beautiful clubhouse separate from the other Barefoot Resort courses that features a world-class pro shop, well- appointed locker rooms, full service dining, snack bar and sports bar. As one would expect, the Dye Course is one of Myrtle Beach’s premier courses and if you include it on your next Myrtle Beach golf vacation you surely will not be disappointed. Book your Myrtle Beach golf package today! Terrific experience! Course is our favorite out of the four courses at the resort. A must play! Great course, our group of 8 all loved it. From tee to greens it was in fantastic shape. We will play this course again.